The men’s basketball team is coming of a winning season last year, which hasn’t happened since the 2006-2007 season. The team advanced to the championship round of the College Basketball Invitation after defeating Eastern Michigan, Mercer and Vermont. They eventually lost to Loyola-Chicago to place runner up in the tournament. The 24 wins mark the third most in the program’s 63-year history and the first 20-win season since 2001-2002. The Warhawks enter this year having been picked third in the Sunbelt in the coaches’ pre-season poll. Coach Keith Richard said he felt the ranking was fair considering the roster they have going into the season. “I thought we would be picked in the top five or somewhere in the upper half of the league. It doesn’t really mean anything in the end but any good news we’ll take right now,” Richard said. The team held their first offical practice Oct. 5 after training throughout the summer. Four starters and nine letterwinners returned from last season’s team including five seniors. 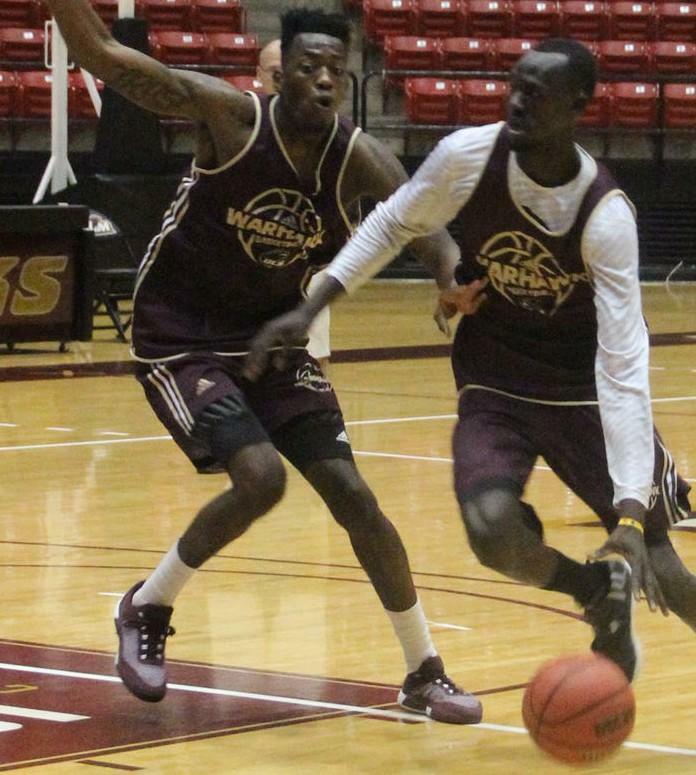 Among these are forwards Demondre Harvey, Jamaal Samuel and Majok Deng and guards Mack Foster and Justin Roberson. “Two key guys that I think will be important to our success or failure are Jamaal Samuel and Justin Roberson. Jamaal has an ability to score points and Justin’s decision making has gotten better to the point where he’s been able to spell point-guard Nick Coppola in practice,” Richard said. The team also has two all-conference selections in Nick Coppola and Majok Deng. Coppola was named Pre-Season All Conference Third-Team while Deng was selected Pre-Season All Conference Second-Team. Coppola finished second in assists averaging 3.7 per game and assist-turnover ratio 2.0 in the SBC last season. Deng finished last season third in the league in blocks and reached six all time in ULM history for blocks in a season. He led the Warhawks with 10.7 points and 7.3 rebounds per game last year. Four newcomers join the roster this season including forwards Ramses Sandifer, Travis Munnings and Roderick Taylor, along with guard Wade Martin. Senior Mack Foster said he’s seen the young guys coming along well. “The new guys are coming along fine we’ve just got to assist them and I know the coach will be on them every practice,” Foster said. Coach Reichard felt Munnings had shown the most consistency throughout practice on a day to day basis. “He does a little bit of everything. He’s going to play a lot here over the next four years,” Reichard said. The schedule features notable non-conference matchups against Penn State on Dec. 12 and West Virginia on Dec. 13. The team begins their season with an exhibition game Nov. 10 before taking on McMurry at home in Fant-Ewing on Nov. 13.